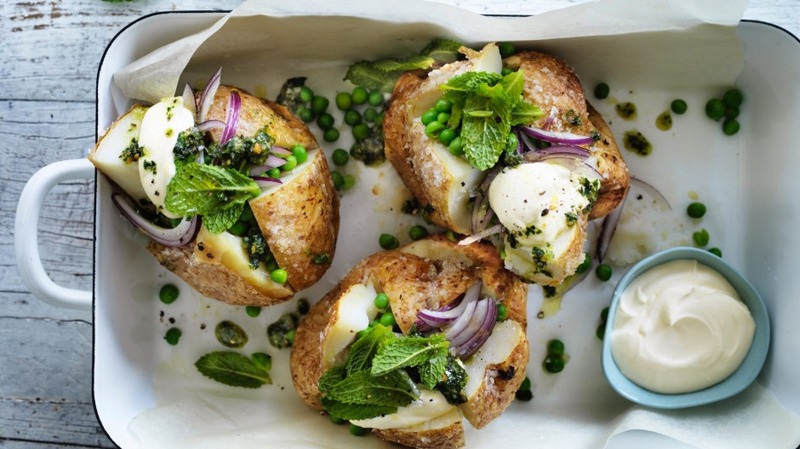 A rough tumble of green peas, mint and parsley with heaps of parmesan and pinenuts turns a steamy jacket potato into a satisfying dinner. 1. Heat the oven to 200C. Scrub the potatoes and pat dry. Prick the skin lightly, coat in olive oil, and roll in sea salt. Bake directly on the oven rack for 50 to 60 minutes until soft. 2. To make the rough pesto, combine all ingredients in a bowl with sea salt and pepper, mixing well. 3. Cook the peas in simmering salted water for 3 minutes if fresh or 1 minute if frozen, then drain and toss with the rough pesto. 4. Cut a cross on the top of each potato, and pinch it open. Season well, and spoon the peas and pesto on top of the potatoes. Add a dollop of sour cream (or ricotta or yoghurt), and scatter with red onion, extra mint leaves and cracked black pepper. Serve hot.